Wrigley was founded in 1891 and has been delighting customers with a wide range of confections ever since. As a subsidiary of Mars Incorporated, the brand is a staple to customers around the world who love the taste and quality of all the products. 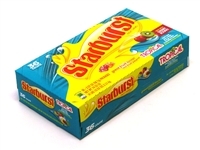 At Wholesale Candy Shop, we are proud to offer a wide assortment of Life Savers candy, Wrigley gum, and other candies from the brand. Enjoy our wholesale prices and large variety. You always receive total satisfaction and top service. Wrigley is famous for its gum selection. Besides traditional spearmint gum, we provide great alternatives. For example, we stock Big League Chew in lollipop form. For people looking for a sugar-free option, Wrigley has two lines of gum and mints. Extra was the company's first sugar-free gum that is known for its long-lasting flavors. Eclipse is the other line of sugar-free gum and mints that kills germs in the mouth. Life Savers are another unique offering that contains no chocolate and comes in both mint and fruity flavors. Wrigley's original Life Savers mints were introduced in 1812 and continue to be famous for their round shape. Share some with yourself! The original fruit chew! The quintessential mint for those looking for a curiously strong taste! Share some with yourself! The original fruit chew taste in a gummy! Available in Original or Sour. Share some with yourself! The original fruit chew! Available in Original and Tropical flavors.